The day is here, June 18, 2010 for my pre-op appointment. I drive with my husband, who is silent most of way. We stop for my pre-op on the way to spend a weekend with friends. I have only told a few select close friends and my oldest daughter that I am having a FL. My surgery is scheduled for July 22, 2010. We are arrive at the office and are escorted to a comfortable waiting room, where we wait for a few a minutes for Jennifer, who is the medical assistant and patient coordinator. Karen, one of the nurses, comes in and gives us some reading material about plastic surgery, which I hand it over to my husband, giving him something to do in the hopes that he will gain a better understanding of the surgery, as well as enlighten him to the fact that Cosmetic Surgery is not just for the obsessed! Jennifer comes in and greets us warmly, sensing my husband’s uneasiness with the situation. I previously warned her that he was not happy about my decision to have a FL. She jokes with my husband to ease the tension. Then Jennifer gets very serious and goes over all the paperwork with us. First, the financial commitment and an outline of the surgery. It is at this point my husband realizes that I am having face/neck surgery. 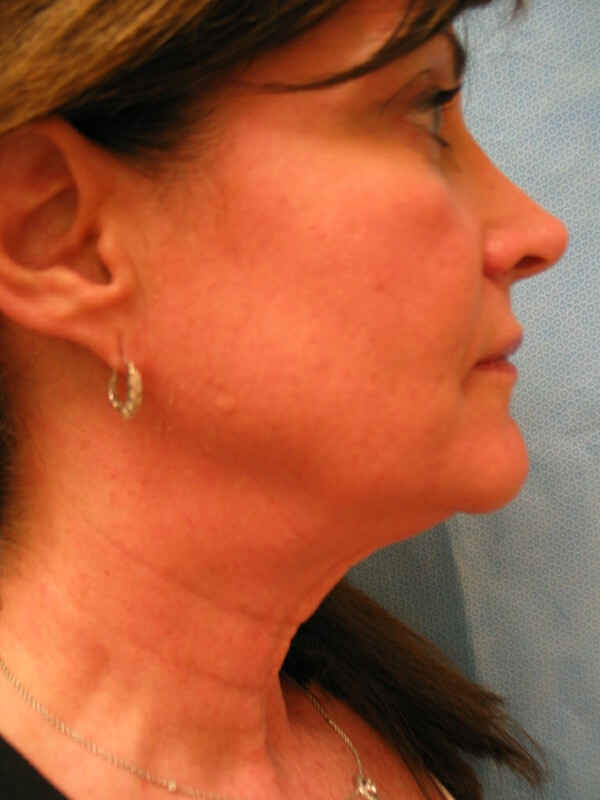 It was Not just the “little” necklift , I spoke to him about prior to my pre-op. He informed Jennifer that I had told him I was just having a little necklift, and never mentioned my face. Oh well… I did not want to make it into a big deal at the time. Jennifer tells my husband how he will love my facelift and that I will look like a younger self, just as beautiful. I could tell that all of this is overwhelming to him. Jennifer describes the procedure, explaining that I would have a nurse for the first 24 hours after surgery. My nurse, Lisa, would drive me back to the office the next day to remove the drains. She gave us the names of several hotels nearby, to check out. We went over the pre-op required tests such as blood work, EKG, Chest X-ray and mammogram. Suddenly, this sounds very overwhelming. My head spins and for the first time, since making this decision, I feel anxious. She assures us that they have an expert surgical team and that my results will be fabulous. Jennifer keeps saying how excited she is for me and that I am going to love the results. I sign all the papers and consent forms, we take some before pictures, and tour the OR. . Jennifer informs me that I will have another consult with my surgeon before my surgery, and that both the nurse and anesthesiologist will contact me. And of course to call her with any questions. We leave and I’m feeling somewhat unsure about this. The realty of the surgery and undergoing anesthesia for 4 – 4.5 hours. This is a lot of surgery, not to be taken lightly. I guess I was in a fantasy world prior to my pre-op, thinking this really is not a big deal.